ISBN M-007-14289-6. Language: French. Text: Messiaen, Olivier. Text: Olivier Messiaen. In contrast to earlier arrangements, which were based on vocal models, in the present case an instrumental piece, the fifth movement from Olivier Messiaen's Quatuor pour la fin du temps was used as the starting point here. 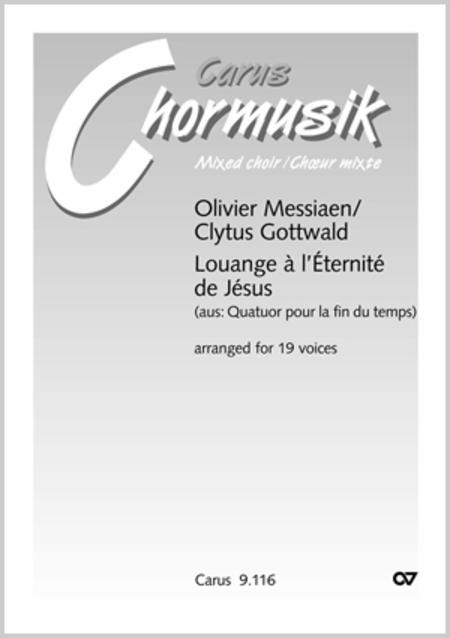 Admittedly the title of this movement, ""Louange a l'Eternite de Jesus"" suggests something entirely vocal, in that the instrumental Alleluias figure in Messiaen's works as speechless exclamation, e. g., in Les Couleurs de la Cite celeste. If in the gregorian Alleluias the instrumental aspect is molded in the shape of speechless utterance; thus works, such as the present movement from the Quatour, refer to the vocal aspect of its origins. Therefore a vocalization of this model had to emanate from such ambiguity. This means there was a text to be underlaid as in a gregorian Alleluia which enabled the singers to articulate the material to be sung without defining any form. In searching for a text which neither told a story, nor reflected one I came upon Messiaen's own text or, more precisely, that which he had composed for his Trois petites Liturgies de la Presence divine: ""Mon Jesus, mon silence, restez en moi ; mon Jesus, mon royaume de silence, parlez en moi ..."" (My Jesus, my silence, reside in me; my Jesus, my kingdom of silence, speak to me). It reflects just that ambiguity which can also be observed in Messiaen's music: It indicates and signifies nothing, and yet it articulates something, seeking with the help of concepts to go beyond a system of concepts - not in the form of a philosophical endeavor, rather in the form of stepping out of oneself. Not for nothing did the original performance marking of the fifth movement of the Quatour is indicated as ""Infiniment lent, exstatique."" (from the foreword by Gottwald).